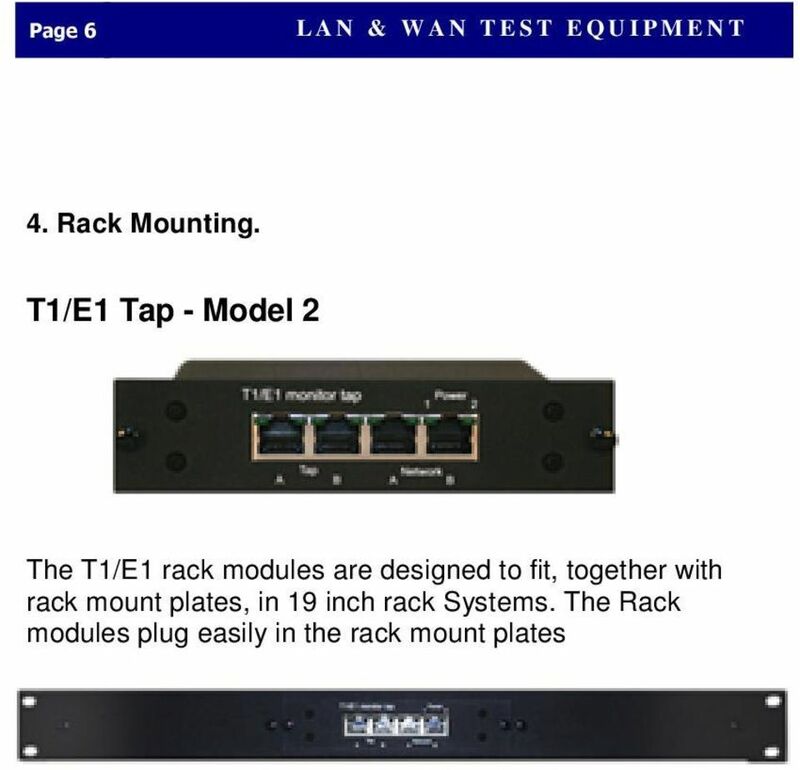 Download "Single Port T1/E1 Tap"
3 w w w. l a n - w a n - t a p. c o m Page 3 SP-T1/E1-Model 2 «T1/E1 NIC type» 1. 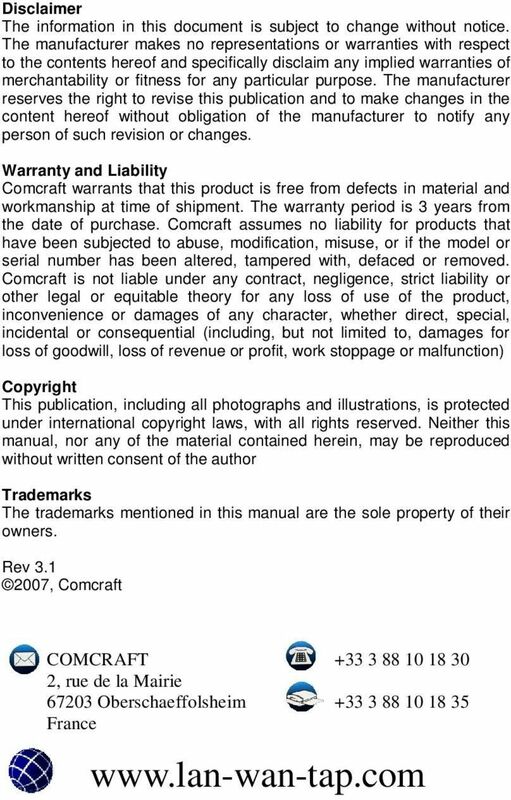 General Information. 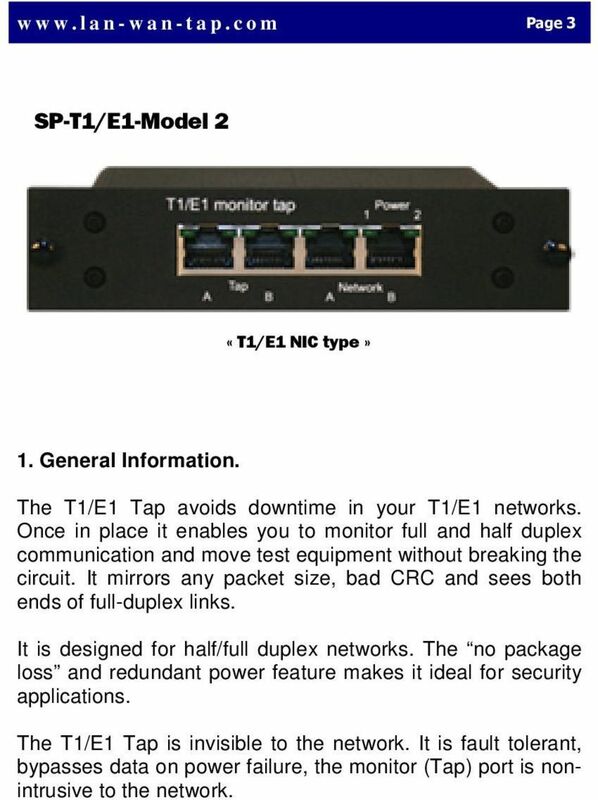 The T1/E1 Tap avoids downtime in your T1/E1 networks. Once in place it enables you to monitor full and half duplex communication and move test equipment without breaking the circuit. It mirrors any packet size, bad CRC and sees both ends of full-duplex links. It is designed for half/full duplex networks. 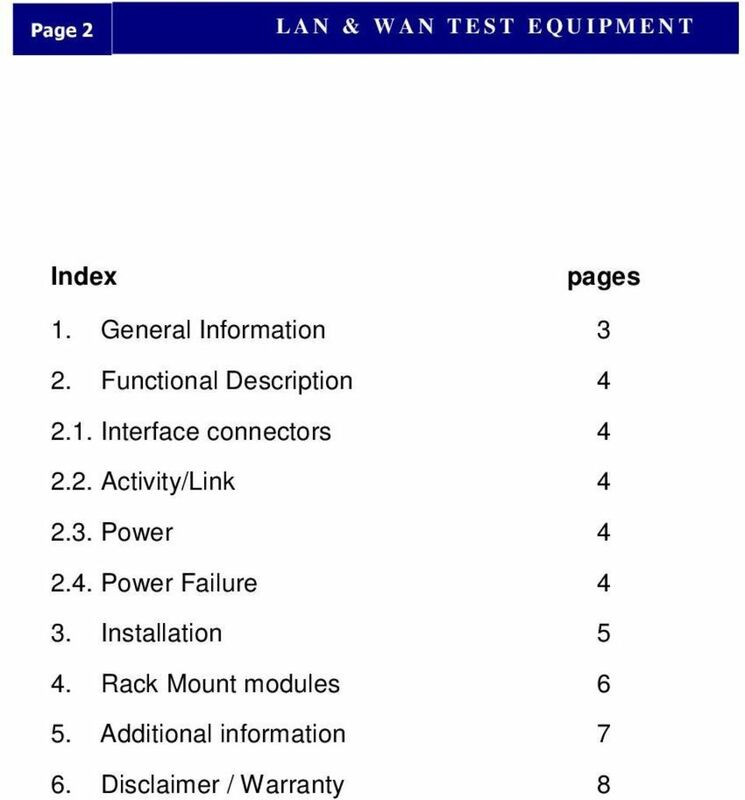 The no package loss and redundant power feature makes it ideal for security applications. 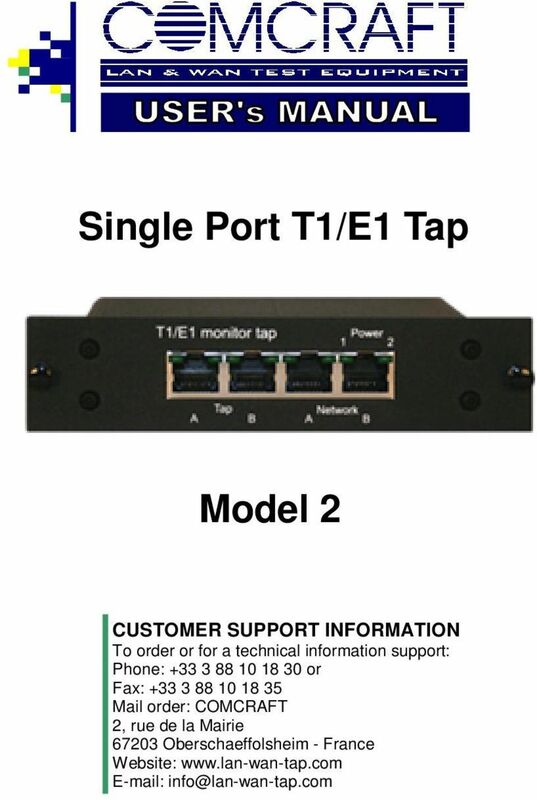 The T1/E1 Tap is invisible to the network. It is fault tolerant, bypasses data on power failure, the monitor (Tap) port is nonintrusive to the network. 4 Page 4 L A N & W A N T E S T E Q U I P M E N T 2. Functional description 2.1 Interface connectors It has 4 RJ48 ports, port A and B are connected to the network, The Tap ports are connected to the analyzer. Network ports A and B are hardware cross-wired together. 2.2 Activity/Link Two (2) LEDS indicate Activity. Activity LED A lights up when a signal is received at port A, LED B for a signal received at port B. The brightness of the LED show signal strength/activity. 2.3 Power The T1/E1 Tap is redundant powered from the back. The external power can be chained as each power has 2 input sockets. Using redundant powering guarantees a maximum uptime off the tap/monitor ports. Two LEDs show the presence of power. 2.4 Power Failure The uninterrupted link in the network guarantees permanent network connectivity, also when power fails. Redundant powering guarantees maximum uptime of the monitor ports. 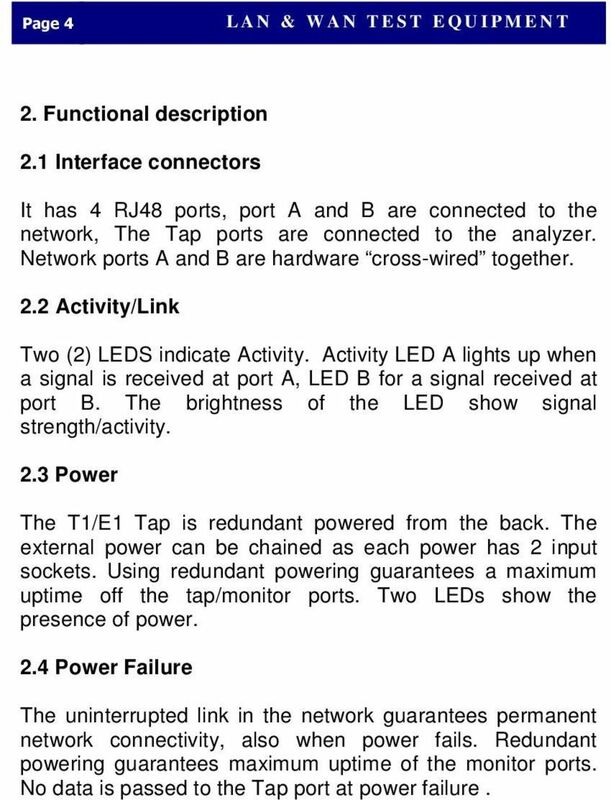 No data is passed to the Tap port at power failure. 5 w w w. l a n - w a n - t a p. c o m Page 5 3. Installation a. Connect Server 1 to Network port A through a straight cable. b. Connect Server 2 to Network port B through a straight cable. * Server 1 and 2 communicate with each other after step a & b. c. Power the Tap with the 12V supply, the Power LED should light. d. Connect Analyzer 1 to Tap Port A through a straight cable. 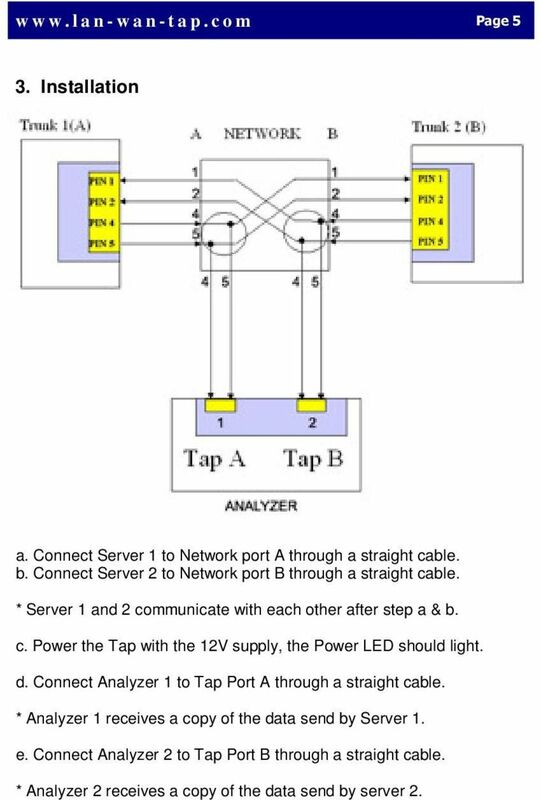 * Analyzer 1 receives a copy of the data send by Server 1. e. Connect Analyzer 2 to Tap Port B through a straight cable. * Analyzer 2 receives a copy of the data send by server 2. 7 w w w. l a n - w a n - t a p. c o m Page 7 5. Additional information. Connectors: 4 x RJ48, 8 pin Power: 12V stabilized / max. 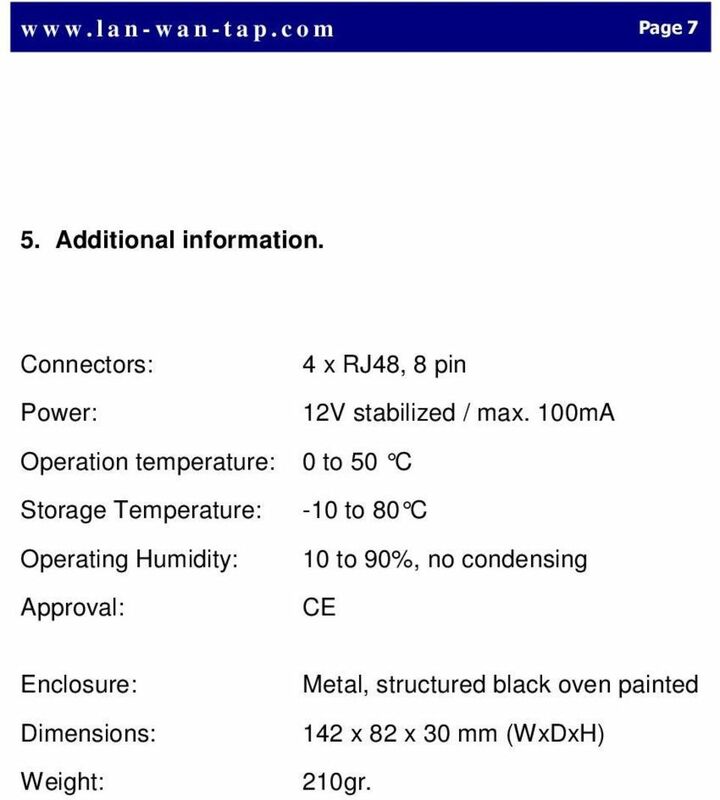 100mA Operation temperature: 0 to 50 C Storage Temperature: -10 to 80 C Operating Humidity: 10 to 90%, no condensing Approval: CE Enclosure: Dimensions: Weight: Metal, structured black oven painted 142 x 82 x 30 mm (WxDxH) 210gr.